As the weather warms up and outdoor adventures are on the agenda, get ready for high-speed fun with these remote control trucks and cars. RC monster trucks and sports cars have come a long way since you were a kid. They are old-fashioned fun but modern components have made them even better. RC cars and trucks are faster and more powerful than ever, with responsive steering and quick braking. Get the feeling of a real race, on a smaller scale. These cars race over all terrains and some have speeds of up to 25 miles per hour. The trucks cover flat, fast paved roads as well as gravel, dirt, mud, sand, and grass. They’re waterproof so they can safely splash through puddles without damaging any of their motorized or electrical components. A high-speed race car is on this list for fun, too. It zooms down the road. Most remotes have multiple speeds, so beginners can practice at a slower pace before ramping it up. High-tech battery and remote control systems mean powerful long-range control. Stand up to 100 meters away from some of these trucks and watch them turn as if they’re immediately in front of you with such a responsive steering wheel. You’ll want to be close to the action, though, to see these trucks jump from ramps and trample any obstacles in their paths. With such sturdy casings and suspension systems, they can take a beating and keep on racing. And at the hobby class, this car and these trucks are affordable, but high quality. It makes them a great value, since they are sturdy vehicles that can handle the terrain without falling apart. These are some of the RC fastest cars at the most affordable prices. 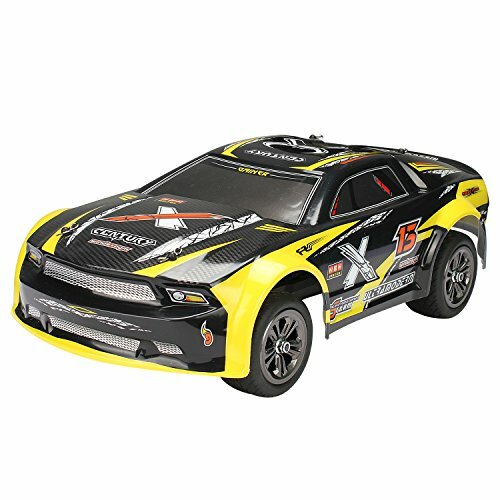 Race on out and get one of these RC trucks or car today. Take them to the beach or the park, or race down the street in front of your house. Have fun in the mud or on a race track. Get to the starting line with one of the sleekest, coolest vehicles out there and blow away the competition. Powered with superb and fast brushed RC380 motor in unceasingly efficient drivetrain , this 4WD truck Rampage speeds topping to 30MPH, which finds operators in marvelous enjoyment. All is fulfilled in hobby class design with classic ball bearings, solid gear diff., independent suspension. It is durable, speedy, funny and yet affordable, which is advisable to be a gift for the R/C beginners or children. 2.4GHz full-function proportional radio control system suffices a stable control range within 280 feet. Reliable transmission forward, brake and reverse would never fail. Splash waterproof electronic components make a all-terrain vehicle out of this truck. No worries to run this truck on grassland , sands, and bumpy grounds. 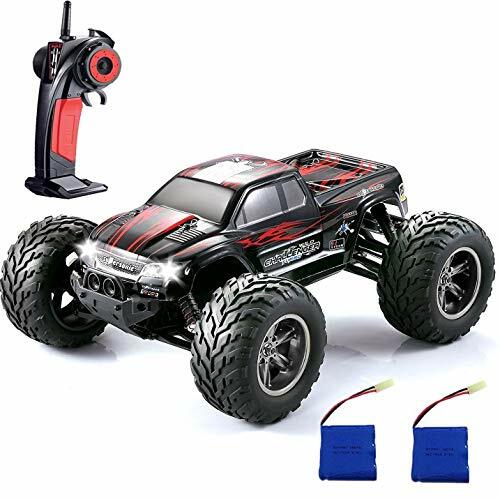 Flexible and solid PVC truck body, high grip V-tread off-road tires, and equipped with long-time service 7.4V, 650mAH Li-ion battery pack, and one qualified USB charger, this truck comes in 99% Ready-To-Run version. Take it out, and get it moved immediately. Making best use of Li-ion battery pack necessitate disconnecting and taking it out from this truck when not in use. All parts in service are available on Amazon. What are you waiting for? Just get it and make it. 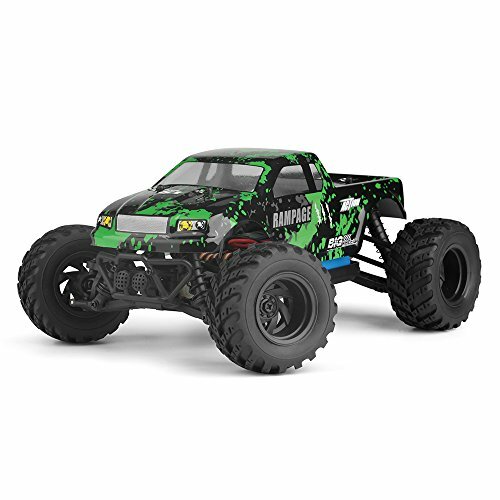 The Rampage monster truck is an all-star all-terrain RC vehicle with super-grip tires and high ground clearance. It’s waterproof and can handle all sorts of off-road conditions from grass, sand, mud, and shallow water. The Rampage is 4WD and Hobby-class powerful. Agile, responsive, and fast, the Rampage will destroy the road. 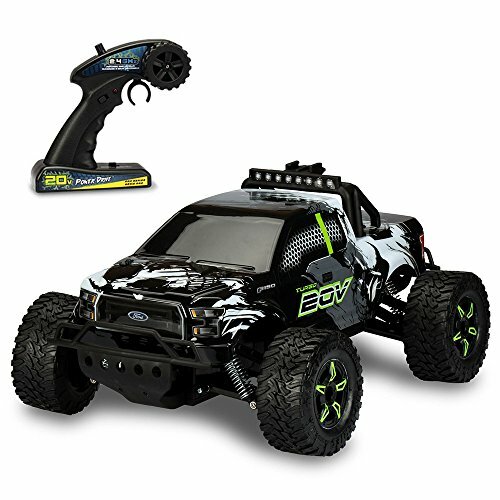 Powerful speed : this remote control truck is designed with durable, strong and powerful components to provide you the realistic racing and off-road game experience. It has the speed of 30 mph powered by a 390 brushed motor. This will be a great mini off-road toy car specially made outdoors entertainment at the park, beach and camping activities. Strong shockproof resistance : The four wheels consist of bouncing spring materials which give support to unexpected dropping and the unstable surface of the ground, make you enjoy the toy car for a longer period of time. Four-wheel drive and full Four-direction control also enable actions like racing forward or backward and turning left or right. Superior control experience : with a range of up to 260 feet and highly responsive steering and throttle, the ergonomic transmitter of the radio remote control car ensures superior control. Heavy duty wheels : it has durable and well-designed tires spikes and wheels to provide high speed and stable running performance. It can be moved by the motor smoothly which is supported by bouncing spring materials to enhance performance. Powered with rechargeable 7.4V batteries : using the original battery on fully charged condition, It will last up to 20-30 minutes on a non-stop operation, plus we include an extra original battery to extend playtime up to 20-30 minutes more. Fat tires for all-wheel drive and all-terrain grip make this Vcanny truck a real monster on the track. It comes fully assembled so just pop in the batteries and go. Go fast, too, with a top speed of nearly 25 miles per hour. Anti-shock suspension and responsive steering make this truck a dream to race. Safety Waring: allow car battery and motor to cool down for 20-minutes before touching; if any questions, please feel free to contact us. Rechargeable Battery Link: https://www.amazon.com/dp/B01N9H2L87. This item is shipped from US, you may receive it in 4 to 6 days. FULL REFUND IN 30 DAYS, ONE FREE REPLACEMENT IN 12 MONTHS. If you have any problems with the item you received, please email us firstly to get helps! Sleek and stylish, this high-speed car will give you a run for your money. Fast tires and a lightweight frame make the FSTgo and exceptional vehicle. At 1/12 scale it’s incredibly realistic, too, compared to its larger counterparts. Approach the starting line in style and blow away the other cars. 【Extended bettery life】up to 30 minutes' Driving offered by the 9.6V 800mAh rechargeable battery pack means you'll always have fuel for the journey ahead, which provides longer entertainment performance. Note: Please charge before use. 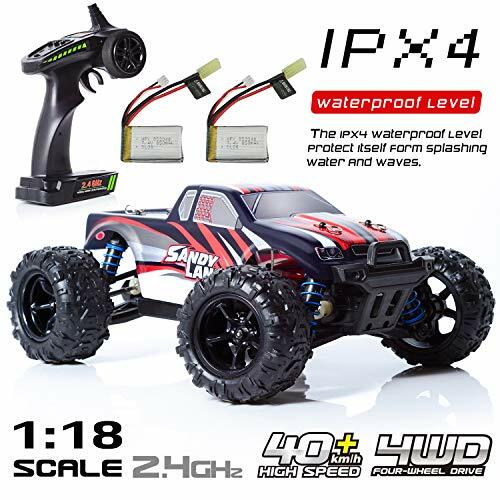 【Long distance remote control.4GHz radio system excels in anti-interference and ensures 100M long control distance, This RC car will bring you a special driving experience. One of the fastest RC trucks out there, and the Threefun Wild Challenger has exceptional climbing capability as well. The impact resistant outer shell and the solid shock absorbers protect the components from bumps and crashes so you can really take this truck out for a good time in the dirt and gravel. USE 20V TOOL BATTERIES! - Have 20V cordless power tools? Swap in 20-volt battery packs from Black & Decker, DEWALT, Porter-Cable, or Stanley for extended RC racing. Fits batteries up to 3000mAh (3Ah) for up to double the driving time! As tough as it’s full-sized counterpart, the Kid Galaxy Ford F150 packs a punch. It features superior suspension and fast tires and sharp graphic design, too. The largest battery in its class of RC cars makes it one of the fastest trucks, too. It runs on the same batteries as your power tools, so you know it’s a powerful car. Take on the desert and the beach, the gravel and the mud. With a GoPro mount on the roll bar, record some of the awesome adventures this truck has. 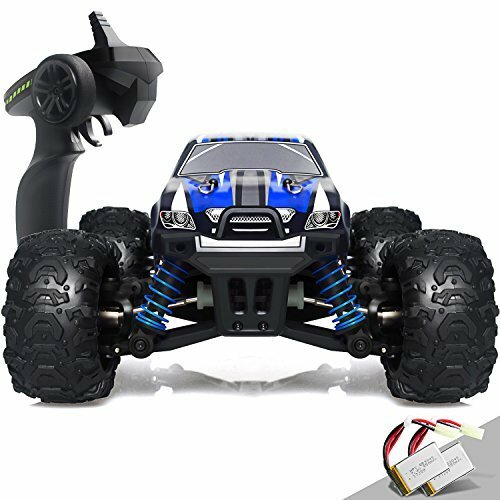 【POWERFUL SPEED】: This remote control truck is designed with durable, strong and powerful components to provide you the realistic racing and off-road game experience. It has the speed of 30 mph powered by a 380 brushed motor. This will be a great mini off-road toy car specially made outdoors entertainment at the park, beach and camping activities. 【HEAVY DUTY WHEELS】: It has durable and well-designed tires spikes and wheels to provide high speed and stable running performance. It can be moved by the motor smoothly which is supported by bouncing spring materials to enhance performance. 【POWERED WITH RECHARGEABLE 7.4V BATTERIES】: Using the original battery on fully charged condition, it will last up to 20-30 minutes on a non-stop operation, plus we include an extra original battery to extend playtime up to 20-30 minutes more. Take this monster truck to the beach. A high ground clearance, heavy-duty tires, shock-proof suspension, and waterproof protection make it ideal for racing through sand and water. This truck takes a beating on an off-road course but comes out on top at the finish. With a long-range remote and highly responsive steering, it changes direction almost as quickly as you turn the wheel. A smooth ride makes this truck a joy to drive. The Sandy Land has super-elevated tires for increased ground clearance and high-quality shocks to manage any terrain. It’s an awesome ride that can handle all the bumps and crashes along the route. It won’t slow down for hills or changes in course conditions. Get outside and give this truck the challenging terrain it was built for.